Tomorrow begins a brand new month. April arrives. During this month, we recognize awareness for Esophageal Cancer. It is estimated that nearly 16,000 people in the United States will be diagnosed with this cancer. Esophageal Cancer is a disease that begins in the esophagus. The esophagus is the narrow tube that carries food and liquid from the mouth into the stomach. The tube is muscular and has four layers. While these are risk factors, it is not cut and dry. Some esophageal cancer patients do not experience any risk factors. There is not a single known cause of this type of cancer. In fact, most symptoms do not occur until the cancer has truly progressed. For example, a tumor may form on the esophagus, but you may not notice it until you find it difficult to swallow. These symptoms can be common in a person without cancer, but if you feel concerned, you should certainly speak with your doctor. Esophageal Cancer Awareness Month is a time to recognize this disease and do our part in helping with research and taking preventative measures. For yourself and your loved ones: maintain a healthy diet. That means no smoking or excessive drinking of alcohol. Also practice proper exercise. You can choose to help the Esophageal Cancer Awareness Association (ECAA). The organization is 100% volunteer based which means any funds donated go straight to raising awareness. The ECAA hosts the Plant a Periwinkle activity. The color associated with Esophageal Cancer is a periwinkle color, which is a light blue. You can choose to honor you dedication to the cause or to someone you know that is suffering or has succumb to the disease by planting the periwinkle flower. At Saint Vintage, our mission is to raise awareness and donate money to cancer research. During the month of April, 50% of all sales from our periwinkle Love Links bracelet will be donated to Esophageal Cancer Awareness. You can do your part, no matter how small. September is Childhood Cancer Awareness Month. Around 16,000 children will be diagnosed with cancer within the next year, which makes childhood cancer the leading cause of death in children. Standing behind each one of these kids is a mother who’s life (at the exact moment she learned of her child’s diagnosis) has been dedicated to the support of her child as they both partake on the journey that cancer has forced upon their families. These mother’s possess a strength, courage, and dedication that is beyond what many others will ever have to endure in their lifetime. These inspiring individuals deserve to be recognized, which is why every year – since 2005 – there is a luncheon that is held in their honor. It has been appropriately called “A Tribute To Our Quiet Heroes.” This event honors the love and dedication that drives these mothers to steer their families through difficult times. Their child’s battle with cancer is also their battle, so this is a day for these quiet heroes to feel rewarded for all the mental and physical trials that have now become a part of their daily lives. More than 1,400 mothers have been honored so far and the number of attendants continues to grow each year! A Tribute To Our Quiet Heroes has raised a substantial amount of funds that have been donated to support childhood cancer research at leading hospital’s nationwide. So far, they have raised over $2.5 million dollars for research! Involved with this luncheon is an organization called CURE that has made it their mission to save lives since they were established in 1975. Through their passion and efforts, CURE has had a hand in increasing the survival rates of children diagnosed with cancer from 10% to 80%! However, they realized they were not satisfied with anything less than 100%. For this reason, they have made it their mission to focus more heavily on the importance of cancer research. They are convinced that childhood cancer can be cured in our lifetime, so, in order for this to be possible, we need to continue to raise awareness and help fight back against cancer through funding cancer research. Saint Vintage wants to honor both these mothers AND organizations in September! During the luncheon, we will be donating one gift from the Saint Vintage Couture collection to each mother that is in attendance as a way to show our support and love for their never-ending courage. 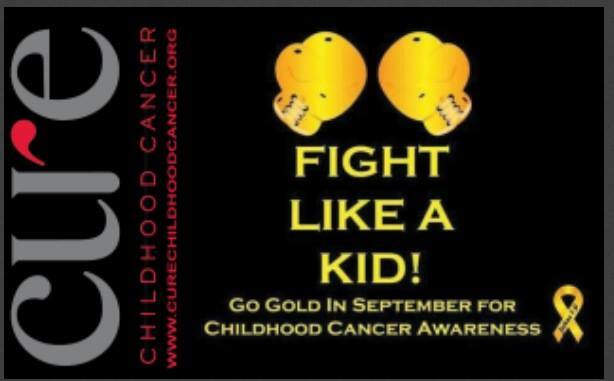 Additionally, in the month of September, we will be uploading even more gold jewelry to our website for Childhood Cancer Awareness Month. 100% of ALL sales on our gold jewelry will be donated right back to the CURE foundation! One person cannot stand up to cancer alone. We hope you will shop our collections and wear your gold in support. Join us in the fight against cancer by giving back and funding cancer research! 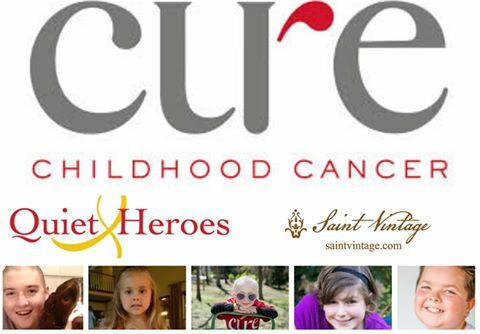 For more information you can check out: http://quietheroes.org/ and http://www.curechildhoodcancer.org/. Saint Vintage was featured on Good Day LA! Saint Vintage was featured on Good Day LA yesterday, by our favorite lifestyle expert and blogger, Sadie Murray. The segment was titled “Ultimate Mother’s Day Gift Guide” but nicknamed as the “Glam” Moms segment! What did the write up on Good Day LA’s website have to say about giving the gift Saint Vintage to your mom on Mother’s Day? It said: “give mom the classic gift of glamor for her special day with Saint Vintage jewelry. Known for their hand crafted designs using a combination of vintage embellishments, along with semi- precious stones, Swarovski crystals, antique glass, vintage beads and antique pearls… Saint Vintage takes pieces of the past and turns them into trendsetting treasures”. Click here to watch the online version of the segment, where we were featured with other glamorous brands. Although this Sunday is Mother’s Day, there is never a wrong time to give the gift that gives back to cancer research! Shop for more styles at Saintvintage.com and stay connected with us on Facebook, Twitter, and Pinterest.